Description: The game is played in first person perspective with a point-and-click interface featuring horror-themed animated cursors (skeletons, bulging-eye skulls etc.). 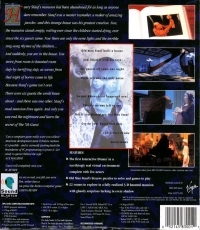 It is one of the first games to be released on the then-new CD-Rom media. The graphics are fully rendered in SVGA, and real actors and actresses bring the story to life during numerous full-motion video cut scenes. The visuals are accompanied by an original, orchestrated musical score. 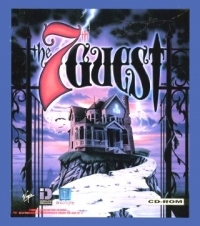 Box Text: The 7th Guest is a puzzle-adventure game which takes place inside an abandoned mansion. Venture into the 22 rooms of the spooky mansion, solve over 20 mind-bending puzzles to unravel a tale of revenge and horror that took place in the 1930s. The owner of the mansion was Henry Stauf, a famous maker of children's toys. Once a homeless drifter and thief, influenced by a vision in a dream, Henry invented a wondrous doll, so incredibly life-like that it sold like wildfire. Stauf's toys became popular overnight bringing fame and fortune and changing his rags to riches. But things took a tragic turn when owners of the doll became infected with a fierce and deadly virus. None of those children recovered. 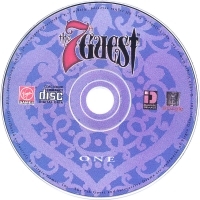 This is a list of VGCollect users who have 7th Guest, The in their Collection. This is a list of VGCollect users who have 7th Guest, The in their Sell List. This is a list of VGCollect users who have 7th Guest, The in their Wish List.